This Albania, Cunard's second steamer of that name, was laid down in 1914 at Scott's Shipbuilding and Engineering, Greenock, but wasn't launched until April 1920 due to World War I. Although she was intended to serve Canada like all of Cunard's "A" liners, her maiden voyage on 18 January took her from Liverpool to New York. 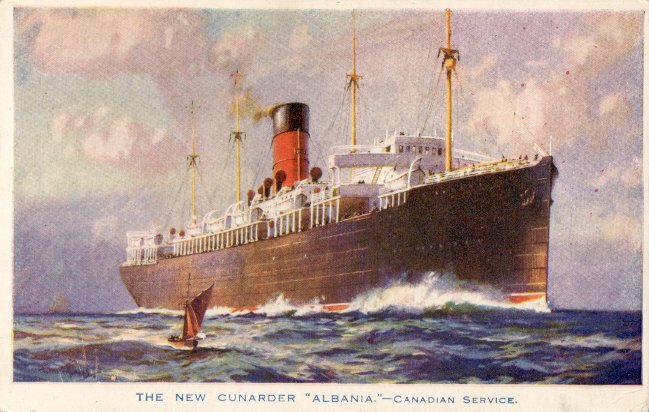 Albania was transferred to Cunard's Canadian service in April 1922, sailing to Montréal in the summer and Boston/New York in the winter. During the summer of 1925, she was placed on the London-New York route and was then laid up. Albania was sold to Navigazione Libera Triestina in 1930, renamed California, and placed on a Trieste-Seattle route. She also served as a hospital ship during the Italo-Abyssinian war. With the reorganization of the Italian merchant marine in 1935, California was transferred to Lloyd Triestino ownership. She was sunk during a British attack on Syracuse on 11 August 1941 and was eventually refloated and broken up.